In the aftermath of the much-hyped race between Girard's Cailie Logue and Shawnee Mission Northwest's Molly Born in Baldwin City, something more is at play than just the speedy times that these two remarkable athletes put up on Saturday. In case you took a realllly long nap Saturday into Sunday, here's how it went down: Logue won at Baldwin in 16:45, while Born was second in 17:11. The matchup between two great high school distance runners lived up to its pre-race billing, and then some. In a little less -- and a little more -- than 17 minutes, these two have set the bar for the next wave of Kansas female high school distance runners. Just a little over a year into the state's decision to move the championship distance to 5K, these two have proudly taken the flag and shown current and future generations that Kansas girls can be pretty tough, too. Both of them have shown that girls from small towns and big towns in Kansas can make a splash on the national cross country scene. And here's the kicker: they have both displayed a high measure of humility in doing it. Logue is as quiet and unassuming a runner as I've seen. She has almost an "Aw, shucks!" attitude when interviewers have heaped praise on her after recent races. I almost feel like she's a little surprised by all the fuss. I also have a hunch it's "good raisins," as my mother-in-law would say, because she's got parents who are just have displayed the same qualities as they watch their daughter speed into Kansas running history. The senior was her school's Homecoming queen Friday night. In a post-race interview Saturday, she remembered her high school principal, who excused her from attending the dance late Friday so she could rest up for Saturday's race. Born's path to the top 20 in the national rankings has been a little less publicized, but no less impressive. Shawnee Mission Northwest has run against great competition and Born has taken on all-comers, most of the time beating 'em to the finish. Her post-race interview at Baldwin is pretty telling; she is filled with the exuberance that most teens should be filled with, and instead of being disappointed with a second-place finish, she seemed excited about her new PR. We have many talented girls and boys in Kansas, fast runners who are multi-talented in school and other activities. But I hope that all of us in Kansas will enjoy the rest of the ride that Logue and Born will take us on in the next few weeks. Even if you support a different team, I hope you take a moment to appreciate and cheer for the talent that these two are putting on display. And I hope that this moment in our state's cross country history is only a start for the many girls to come who also want to excel as athletes and human beings. In what I would say is a statement race, the Olathe East boys won the Seaman Invitational in Topeka Saturday with a nail-biting, one-point win over Mill Valley, whose 38 second pack time came up just short of the win. In fact, Mill Valley put seven runners in front of Olathe East's fifth runner, but Olathe East's front-running strength got the job done. The Hawks' Ben Kahnk won the race in a blanket finish, clocking 16:22 to edge out teammate Ryan Weishaar (16:23), Mill Valley's Greg Haynes (16:24) and East's Will Tindall (16:25). Mill Valley, who's going to be a load for St. Thomas Aquinas' boys in Class 5A, put seven runners in the top 13, all under 17:07. Olathe East, charging hard in its quest for the 6A boys title, posted a pack time of 51 seconds Saturday. Dawson Podlena of Seaman (16:29) placed fifth in the race, sandwiched by Olathe East and Mill Valley runners. Perhaps overshadowed by the Logue-Born matchup was Shawnee Mission North's team win in the girls division at the Baldwin Invitational. The Indians beat a very good St. James Academy team, which won the Rim Rock Farm Classic one week earlier, as well as Sunflower League rival Shawnee Mission Northwest. Amber Reed (18:55) and Katie Kasunic (19:16) were third and fourth to lead the team win. Shawnee Mission North also won on the boys' side in a tight four-team race. Just five points separated the top 4; North had 77 points followed by Bishop Carroll (79), Blue Valley Southwest (80) and St. James Academy (82). Dylan Miller of Blue Valley Southwest clocked 16:13 for the individual win. In Peculiar, Mo., St. Thomas Aquinas' Margaret Pigott was crowned the Kansas City Classic (formerly KC Metro Invitational) champion as she avenged a loss to Blue Valley North's Lily Strauss the week before at the Rim Rock Farm Classic. Pigott won in 18:49 while Strauss matched her 18:57 time from Rim Rock, and teammate Sophie Scott was fourth in 19:04. 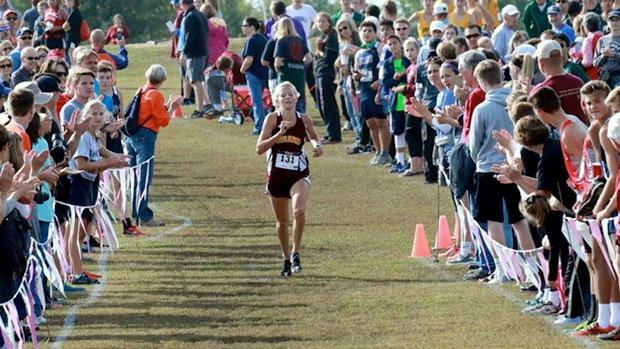 Kansas schools whipped their Missouri counterparts in the girls team standings. Aquinas won the team title with 68 points, followed by Blue Valley North (89) and Olathe North (122). In the boys' race, Spring Hill's Dylan Brenneman got out-leaned at the tape, finishing second in 15:53.9 behind Rockhurst's John Luder (15:53.6). Aquinas' Alex Gill was third in 16:01.3. West Torrance, a powerful team from California, rolled to the team title, scoring 37 points to runner-up Aquinas' 81. Kerby Depenbusch of Great Bend and Gabriela Reyna of Wichita North looked strong in winning individual titles at the Junction City Invitational. Depenbusch (16:21) held off Salina South's Josh Reed (16:23) for the win, while Reyna lowered her season PR to 18:44 with a win over Manhattan's Cara Melgares (19:26). Manhattan swept the boys' and girls' team titles. On Thursday of last week, Garden City traveled to Canon City, Colo. and ran quite well in the thin air, finishing second in the boys' team standings, and fifth on the girls' side against several of that state's best 3A through 5A teams. In Council Grove, Hayden's boys and Riley County's girls were the team champions. Kyler True of Olpe, coming off a bout of tendinitis, won the boys' chase in 16:40 followed by Hayden's Robbie Schmidt (16:45) and Parker Ramirez (16:59). Santa Fe Trail's Hannah Honeyman clocked 20:12 to win by more than a minute over Lebo's Kasey Besack (21:22). Several schools swept team titles at meets held last Thursday, including Andover Central (Winfield Invitational) Scott Community (Ness City Invitational), Tonganoxie (Perry-LeCompton Invitational) and Christ Preparatory Academy (Maranatha Christian Invitational). Results of all of these meets can be found on MileSplit KS. Pat Melgares recaps the week's cross country scene in Kansas each Sunday at about 12 noon. A reminder to all coaches to please send results of your meets as soon as possible each Saturday afternoon. Excel and HTML formats work best, but PDF files also can be used in the MileSplit database. Please send results by email to melgares@LetsGoRun.com, or to Jim Madison at madisonj@westelk.us.